Day two in Iwanuma meant our first journey into the now mud-coated area directly hit by the March 11 tsunami. Upon arrival at the volunteer centre, we were assigned a team and our task for the morning – shoveling mud around a house close to the Sendai airport. I had watched live online as a wall of water flooded in around the airport on the day of the earthquake, and so it was obvious that the area that we’d be going to was one that was hard hit. We gathered our tools, donned our protective gear of masks, goggles, gloves, and long sleeves, and boarded a mini bus with our team to travel to our work site. 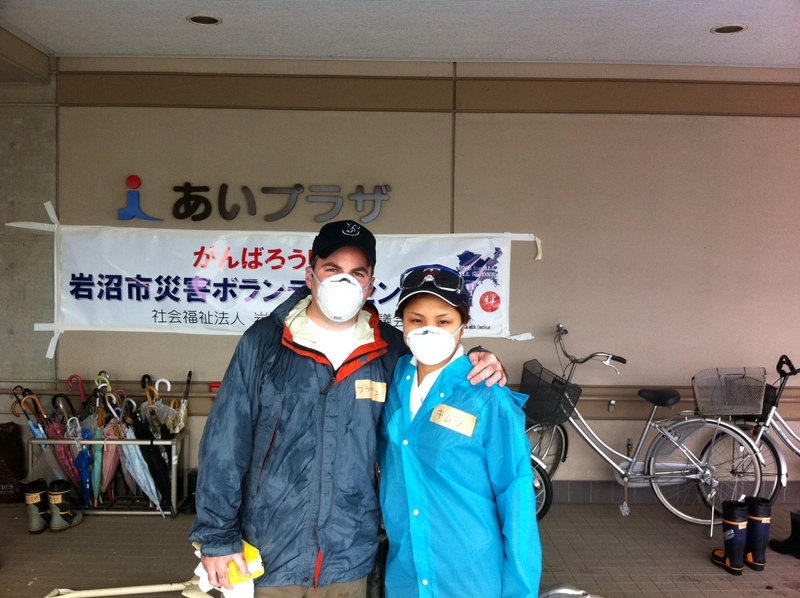 My fiancée Nana and I at the volunteer centre after a morning of work in the mud. We look deceptively clean, but this is after getting caught in the rain and then being hosed off upon our return to the centre. The area around Iwanuma is home to a great deal of farmland, and these fields have been left relatively untouched as the priority for recovery efforts have focused first on the buildings that are still intact. So as we drove to the house where we’d be working, we passed by all sorts of debris littered across the landscape; cars with shattered windows and mud-caked intakes, pieces of roof, and sadly more personal objects like shoes, toys, and a teddy bear. The once fertile rice fields are now coated in a thick layer of mud laden with salt water from the sea, and so it’s unclear when the area farmers will be able to again tend to their land. Our van dropped us at the house where we’d be spending the morning. While the woman who lived there had already been working hard to clean out the house itself, having removed bag upon bag of garbage and all of the tatami mat flooring, she needed our help to dig out all of the mud on the surrounding property. We sweated through our masks and got down to work shoveling mud from every nook around the house. Most trips with the wheelbarrow revealed new finds in the mud – more shoes, CDs, even membership cards that were still intact. Despite having lost nearly everything, this homeowner and all of the others that we would work with over the next few days insisted on offering us drinks and snacks when we stopped to take a short break. We were guests in their homes, even if those homes were now only shells of their former selves, and so we guiltily obliged. After a quick lunch back at the volunteer centre, we moved to our next worksite for the afternoon. We were brought to another house and got to work trying to remove mud from a garden area. This family, like many in the area, was very tied to the land, and so they try to grow the majority if not all of their vegetables themselves. A garden may seem like a luxury for many, but for this family it meant being able to support themselves and stand on their own feet. During our coffee break the homeowner told us of how the main centre of Iwanuma used to be much closer to the sea, but was moved inland after being destroyed by a tsunami hundreds of years ago. Over the decades the town has gradually stretched closer to the shore, having forgotten the lessons of history. Still, standing in the garden far from the sight of the sea, it was hard to fully understand the waterline that we could see still visible on the fences and walls around the house – it reached up past my elbow, and we were over 2km inland from the shore.